Taipei, Nov. 20 (CNA) National Taiwan Museum, built in 1915, will reopen to the public on Tuesday after undergoing its first renovation since being designated a national historic site 19 years ago. The renovation is an important event, said Ministry of Cultural Affairs Cheng Li-chiun (鄭麗君) in a ceremony on Monday that marked the planned reopening of the museum located in 228 Peace Memorial Park near the Presidential Office. "We undertook the restoration based on strict standards governing cultural assets with the purpose of maintaining and protecting our cultural heritage," Cheng said. Museum Deputy Director Wang Yi-chun (王逸群) pointed out that the most challenging task in the renovation was restoring the gypsum-made artificial marble walls and fixing damaged structures. The difficulty was not restoring the museum to its original likeness but "seeking out lost techniques," said Wang. Taking the restoration of the artificial marble walls as an example, he says "we asked master Kuo Ching-po (郭清波) to test many different kinds of gypsum and various paint-mixing methods" before finding the best way to restore the walls, he said. 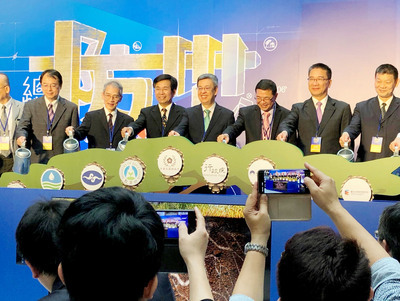 To mark its reopening, the museum, which became a national historic monument in 1998, has organized a permanent exhibition titled "Discovering Taiwan: Revisiting the age of natural history and naturalists in Taiwan," which will open on Tuesday. The museum will also open exhibition space on the third floor to the public, which has been closed for three years. Visitors will be able to view 367 important cultural and historical relics and natural history specimens, including a Formosan clouded leopard, an endemic species that is now extinct. The museum also plans a special exhibition on the first floor to mark the 100th anniversary of the discovery of the Formosan landlocked salmon, a freshwater salmonid fish endemic to Taiwan. The exhibition will be open from Nov. 21 to June 30, 2018.